Today, our Around the World Week tour takes us to Australia’s StoryWeaver. They co a lot of Savage Worlds development, but they’ve got some other interesting things going on as well. This particular Pick is a callback to one of Pinnacles older Weird War settings, Tour of Darkness. Blood of the Innocent is a dark, violent immersion in the hell of the Vietnam War, with plenty of even darker and more horrible elements at work. Vietnam 1968: As the Tet Offensive pushes forward and casualties mount, dark secrets are at play. Amongst the bloodshed, an ancient evil struggles to be reborn deep in the jungles. They say that in war innocence is the first to die… but it’s certainly not the last. 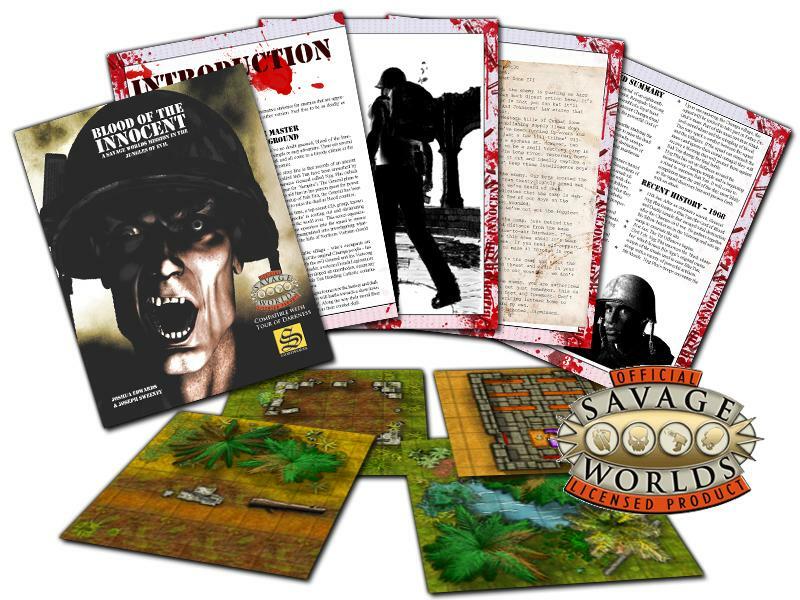 Blood of the Innocent is a Savage Worlds adventure of grim horror set in the chaos of the Vietnam War. As a ready-to-go adventure for an existing modern military campaign, or as a single-shot game, Blood of the Innocent drags your heroes kicking and screaming through the most dangerous and horrifying of war stories. Be warned… Blood of the Innocent is not for the weak of heart. Player characters to die for! Plus bonus 45 pages of printable extras gives you everything you need to start playing right away! 38 beautiful 7×7″ battlemap tiles suitable for ANY mini’s game. 2 pages of character tokens, featuring US troops, Vietcong, villagers and monsters!